An intriguing painting exhibition opens today and runs until October (10.00 – 20.00). Roger Tourte (1903 – 1972) was a French painter who lived in Greece for the last 35 years of his life. 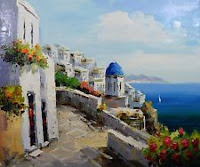 In more than 5,000 gouaches (watercolours), he depicts the beauty and light of the Greek islands which is threatened by tourist development. In P. Nomikos Conference Center, in Fira. At 19.30.